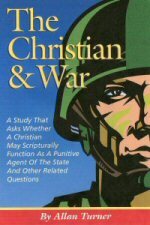 On June 3, 2004, I had the opportunity to make a PowerPoint presentation to a group of preachers from the Cincinnati, Dayton and Northern Kentucky areas on the subject of whether or not a Christian could participate in war-fighting. Because several were interested in having this material available to them, I have decided to make it available on this site. If you do not have PowerPoint, you will not be able to view this material in that form, so I have also made it available in PDF format, which most users already have on their computers. If you have any questions or comments, please feel free to contact me. For those of you interested in the published book, you may purchase it below.